EDIT by Mateo: Updated the link, because the old one was dead. Thanks for posting man! I was gonna grab this from Twilight, but since it initially wasn't available to everyone I decided I'd leave it up to you. I thought we were suppose to know how to do this in a hex editor or something... o well its very useful. well originally he had it posted and wanted you to PM him for it, but he decided to post the link here now. 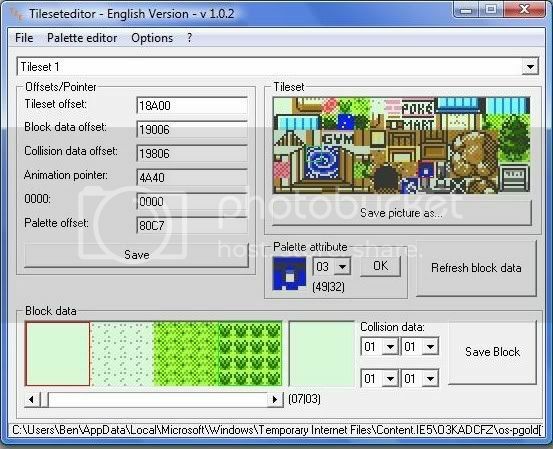 But I can't edit the tile Graphics themselves, do I have to do that manually? There was a tutorial my Mateo on Twilight Hacking explaining how to repoint the graphics, but I'm not sure if it's posted here yet. Tile Layer Pro is the one I use. Did this tool works with Pokemon Crystal??? I haven't tried it with crystal, but given the fact that crystal uses larger tilesets, and the window for tilesets is set at normal size, I take that as an indicator it was not intended for use with crystal. As Mateo said, this program is not compatible with Crystal at all, the program will crash if you attempt to open a Crystal ROM. Can you make this compatible with Crystal? Re-upload please it doesn't work. After you got there, select the TilesetEditor and you are done. The German language tileset editor shows up this : Error reading file. application is terminated on every rom. any1 help"? sorry for double post. I can't help, i can't get to the computer while a national test is going on as i have to study for it. I'll try to upload an english version as soon as possible, Sorry. ok i will wait. thanks any way. Oh thank you!! it's the best./an awesome tool.